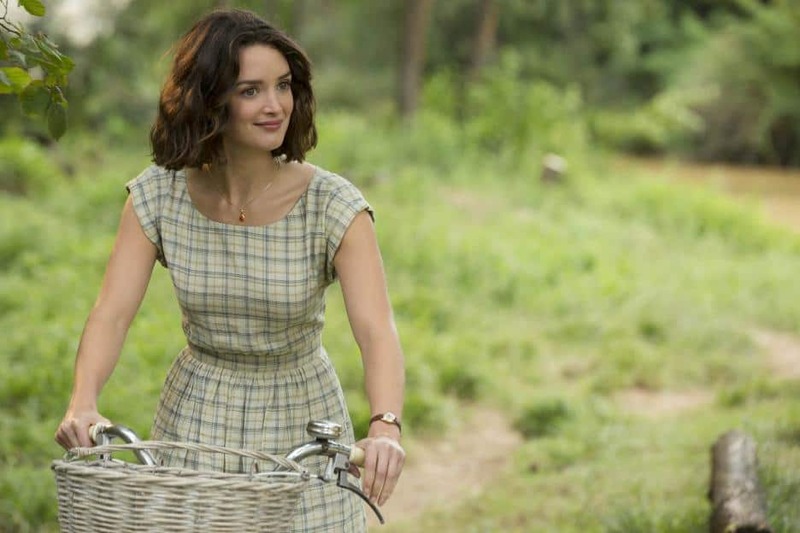 This week, I saw The Hundred-Foot Journey, in which romance simmers between the young sous-chef Marguerite (Charlotte Le Bon, above) and the talented would-be chef Hassan (Manish Dayal) as they encounter one another in travels by bicycle around the picturesque South of France village where this film unfolds. As she pedals casually along narrow roads and paths, Le Bon charms in simple dresses of cotton and linen, all with fitted bodices accompanied by fuller skirts in the classic shirtwaist style. I love this look for the city, as well. We talk a lot here about the everyday freedom of cycling – just getting on the bike and riding without too much fuss – and dresses like this deliver with style points and ease of motion. My personal favorite over the past few months has been a Samantha Sung shirtwaist in cotton with a full, mid-length skirt. Its bold indigo pattern (right, from my Instagram) really popped on Citi Bike. Le Bon’s dresses are summer styles, as well, but this silhouette, in a variety of lengths and fabric options, is well-represented in early fall collections. What could be simpler or more feminine for work or a night out than one of these frocks? Pair them with cropped sweaters as temperatures cool in the mornings and evenings, and add some simple accessories to channel Le Bon’s winning look. With one exception, the prices on these dresses are obscene. We need to keep it real if we want people to feel comfortable bicycling. Showing clothing which costs more than most people earn in a week, not to mention expensive, heavy bicycles, only perpetuates the myth that it is exclusive. Bicycling should be accessible, comfortable, affordable and fun. Hi Nina, thanks for reading and commenting. I get what you’re saying regarding the prices. As in fashion magazines and websites, our intent is to share inspiration and trends. The shape of the dress for comfort and ease of pedaling (on an upright bike) was my focus here; but it’s all about making a look one’s own, and similar dresses can be found at a variety of price points. I agree. The subject about price of the dress was irrelevant. The story was for inspiration purpose.